Before November’s Arctic front set in, Oxford’s Early Career Academic Outreach Network (OECAON) met on a warm October evening at Somerville College for the Michaelmas term training session. The afternoon saw the appearance of the Network’s newest co-coordinators, Jessica Boland and Sarah Jones. We kicked off with Dr Eleanor Parker’s insight-packed introductory lecture into outreach at Oxford. Topics ranged from the secondary education system in the UK and the state of Higher Education, to a summary of Oxford-wide outreach initiatives in addition to college- and department-led taster days. Whilst Eleanor gave a whistle-stop tour of Oxford outreach, Jessica Boland led a successful workshop on how experienced members can improve their schools-based taster sessions. As in every term, the OECAON training session aims to provide Oxford’s early career researchers with the most comprehensive and accessible overview of Oxford’s outreach initiatives, as well as practical information on how to get involved. With week nine just around the corner, our final session concentrated on the Oxford undergraduate admissions interviews. We learned that the interviews are a central cause of great anxiety for schools, teachers, tutors, parents and – finally – the students themselves. Lecturers at Oxford often discover that their undergraduate cohort was wracked with nerves about the questions they were about to face at their interviews: the stereotype of an Oxford don turning to a nervous teenager and quizzing them on the nature of life couldn’t be further from the truth. OECAON members are often asked about the interview, and are always more than happy to demystify the process. Oxford’s interviews to assess how suited a student might be to our tutorial system of teaching. We’re not looking for candidates who are already fully clued up on their subjects, but rather the students who have the potential to be challenged and pushed, to have their minds expanded by exploring topics of which they weren’t previously aware. The Oxford interview seeks out the candidates with the most potential, not those who have already fulfilled it. The first part of the interview is often subject-specific: the interviewer will present an object of study, such as a literary extract, a political theory, or a mathematical equation, and ask the student to interpret it. The student is not assessed purely on their knowledge, but rather on how they use the information the interviewer provides in order to better understand the object of study with which they have been presented. In the Admissions Training for Oxford tutors, participants are encouraged to try and use a ‘question funnel’. The question funnel is a simple concept, allowing the interviewer to pose an open question before narrowing into more specific questions. Interview questions may begin very broadly, and then focus increasingly on more specific details so that the student teases out a problem for themselves. This model allows the interviewer to understand an interviewee’s broader understanding of a topic, as well as probing their ability to make sense of detail. I am a D.Phil student in French and have interviewed students applying for places for French and History (which was also my BA) and used the question funnel to structure my interview questions last year. Interviewing on behalf of the French department, I would start with a broad, open question that sought to understand how a student viewed their degree choice. My personal favourite is ‘what is the link between literature and history?’. I’m never looking for a textbook definition of each term, but rather for the student to explore what we mean by each term, to contrast them, and, potentially, to find unexpected analogies between the two. Working from how the student answered their open questions, I would ask them a more specific question such as ‘does literature passively reflect history, or can it actively change the course of history?’ This question juxtaposes a commonplace idea about literature, that it merely reflects historical change, with a more radical idea that literature can change history. Examples on either side might be Gustave Flaubert’s Sentimental Education (1869) which depicts the aftermath of the failed 1848 revolution, and Harriet Beecher Stowe’s Uncle Tom’s Cabin (1852) which Abraham Lincoln cited as one of the reasons for the American Civil War since it stirred up anti-slavery feeling in the northern states of America. To wrap up the interview, I will often ask the student to re-articulate their ideas in a few sentences. These final questions are an essential way for students to learn how to reflect on the pathway that they’ve taken to reach a particular conclusion, and to work out how to summarise their thoughts according to a hierarchy of importance. I also like to ask a hypothetical question to really challenge the student: ‘would history be different if literature did not exist?’ Moments of reflection and/or hesitation are warmly welcomed at this point (as they are throughout the interview process) – an interviewer would never anticipate that a student had considered a question such as this before! OECAON’s members are committed to demystifying the imposing façade of Oxford and to opening up higher education to all potential applicants. One barrier to entry is the myths surrounding the undergraduate admissions interview, but there is no longer any reason for these myths to persist. Oxford interviewers are looking to see whether the interviewee could become an Oxford student – and the only criterion for this is whether they have the potential to be taught and be pushed by their teachers, and classmates. For more information on the University’s admissions interviews, including sample questions provided by tutors, please see www.ox.ac.uk/interviews. For more information on the Early Career Academic Outreach Network and getting involved with Oxford outreach projects, please email eleanor.parker@admin.ox.ac.uk. Sarah Jones is a second-year D.Phil student in French, and college lecturer in French at Oriel College. She is co-coordinator of the Oxford Early Career Academic Outreach Network. One of the best ways to encourage students from non-selective state schools to consider applying to university is to start early. This seems to be a guiding principle behind the Oxford Pathways Year 10 Taster Days. Earlier this year, I got a taste of these excellent outreach days for myself, and I’m going to try to give you a flavour of them in this post. For those unfamiliar with the scheme, Pathways is coordinated by the colleges of the University of Oxford, with support from the Sutton Trust, and is spearheaded by a dedicated team of college outreach staff. The programme seeks to provide information about higher education (and Oxford, in particular) to academically able students, and staff, from non-selective state schools with little history of sending students to Oxford. To this end, Pathways organise numerous visits to Oxford and application information sessions throughout the year, aimed at students from Years 10 to 13. All sessions are free, and give pupils and teachers a taste of student life in Oxford, which many may never have even heard about – least of all experienced for themselves. So where does a PhD student working on eighteenth-century French literature (that’s me), fit in? As part of the Year 10 Pathways Days, the students visiting Oxford get to experience a small taste of university academic life. This comes in the form of an hour long, interactive academic taster session, led by an academic or doctoral researcher. After attending one of the Oxford Early Career Academic Outreach Network’s training sessions, where the Pathways team introduced their scheme, I signed up to lead some of these academic taster sessions. I was asked to deliver a session related to my research, but that would be accessible (yet challenging) for 15-16 year old students who may have no knowledge of (and perhaps no interest in) my discipline. The challenge for me, then, was to make eighteenth-century French accessible, relevant, and enjoyable for a group of Year 10s who have just had lunch and would quite like a nap. Moreover, I had to try to show them, in just an hour, that attending university could be something they might enjoy. I decided to deliver a session centred on Denis Diderot – one of the most important French philosophers of the French Enlightenment (although not necessarily a name many in the UK know). I focused on a short, humorous text by Diderot, the Regrets sur ma vieille robe de chambre (Regrets for my old dressing gown). The work is, nominally, about Diderot’s distress at acquiring a new dressing gown (more of a house coat than a dressing gown, which he often wore when writing). Diderot regrets having thrown away his old dressing gown, and tells the reader about his similar regrets at having acquired new furniture and art for his home; these objects may be new and luxurious, but they are just not the same as the old ones. These new possessions make Diderot uncomfortable, and don’t say as much about him as the old ones did (or, rather, they don’t say the things he wants them to say). With the aid of some props; a digital presentation; and with reference to Bono’s favourite black trilby hat, I encouraged the students to think more analytically about Diderot’s text. What exactly does he mean in certain passages? Could we call Diderot a ‘materialistic’ person, and what different senses might this word have? And, reciprocally, I asked them to think about their own relationship to their possessions. What is their most important possession and why? What makes something a ‘luxury’? At the beginning of the hour, I had asked the students to raise their hand if they thought it was morally bad to be materialistic; most raised their hand. At the end of the hour, I asked the same question; this time, few hands were raised. And in one session, I was delighted to get a question back from a pupil: ‘do you mean Diderot’s materialism, or ours?’ By the end of the hour, the students had begun to re-examine their preconceptions, and to ask questions of their own. Even if they didn’t leave loving Diderot as much as I do, I hope my taster session allowed them all briefly to experience of the sort of work that goes on at a university, where ideas are challenged and questions are raised. As a ex-pupil of a non-selective state school, I have experience of some of the many barriers to university that such pupils can face. I hope these Year 10s and their teachers left with a better knowledge of what studying at university involves, and with the confidence that they could all make it to university, should they wish to. And perhaps just one or two might even consider studying French!? Image credit: Louis-Michel Van Loo, Portrait of Denis Diderot (1767). Oil on canvas. Diderot Collection. Gift of M. de Vandeul to the French State in 1911. The Oxford Early Career Academic Outreach Network aims to connect interested D.Phil. students, fixed-term teaching and research staff from any discipline with opportunities to engage with schools outreach projects run across the collegiate University. As you will be aware, we run termly tailored training sessions and manage a database of interested researchers and teaching staff to which professional outreach staff from across the University have access. Whether you are an experienced admissions interviewer, or brand new to Oxford and its admissions processes, come along to discuss the admissions interview training offered to Oxford academics (and how useful you find it in admissions) and discuss how we talk about interviews when working with students and teachers in schools and colleges. Interactive activities from both ‘sides of the desk’ will feature. After the session, participants are warmly invited to The Victoria, Jericho from 6.45-8pm to network with each other and outreach staff from around the collegiate University. Whether or not you are able to come to the training session, please do come along and share your outreach and public engagement experience and find out more about how you can connect with schools outreach work across the University. Further enquiries about the scheme can be directed to the coordinators via eleanor.parker@admin.ox.ac.uk. The team consisted of two University admissions staff, a college outreach officer (each area of the UK we went to is affiliated with a particularly college), two current students, a maths admission tutor representing sciences, and me, representing humanities. During the sessions we introduced the attending teachers to the slightly unconventional structure of Oxford, before discussing the various array of tests and interviews that make up the undergraduate application process. As part of the University I inevitably took for granted not only how complicated this process can seem, as well as how many frankly bizarre myths surround the process! (things like the importance of sitting in a specific chair, or what to do if a tutorial fellow throws a piece of fruit at you!) It was clear that for all the hard work Oxford puts into elucidating the entrance procedure, it still carries a lot of stigma confusion. By far the hardest task of the conference was persuading some of the attendees that – contrary to belief – Oxford admissions doesn’t actually use a magic sorting hat to make its decisions . . . In all seriousness, being part of such an incredible team, and seeing how inspired the attendees were at the end of the day was hugely rewarding. Talking to the teachers informally after the sessions were over, it was clear how much the events had meant to them too. Without exception, each attending teacher talked about their students with such pride, and it was incredibly moving to hear them describe the newfound confidence they now had to help support these students with a possible Oxford application: something which, for many, was something they had never imagined doing! Our Hilary Term training took place on Tuesday 16th February (5th week) 2016. See below for a summary of the afternoon’s programme, and keep an eye out for our training in Michaelmas Term! There are many similarities between the admissions processes at Oxford and Cambridge but also a number of differences. The Oxford and Cambridge Collaborative Outreach Network encourages cross-institutional communication and sharing of resources in order to reduce duplication of effort and encourage schools and colleges to make the most of the outreach opportunities on offer to their brightest students. This session will give an overview of the Network’s activities and provide a (former) Cambridge insider’s insight into the main differences between the institutions that we should be aware of in our outreach and communications work. It will also cover how early career academics can get involved in the development of the new Oxford and Cambridge Collaborative Outreach website and e-resources. The Oxford Education Deanery is a research-engaged professional learning partnership between the University of Oxford and local schools. It was formally launched in November 2013 with the aim of drawing on the expertise of university-based specialists to support local teachers’ professional learning and so improve outcomes for pupils in local schools. This talk will introduce the work of the Oxford Education Deanery and focus on the ways in which members of the Early Career Academic Outreach Network might contribute to one of its specific objectives; that of providing access for teachers to subject knowledge expertise for curriculum development and to research-informed responses to the particular subject-specific pedagogical challenges that they face. After the session, participants are warmly invited to The Victoria, Jericho from 6.45-8pmto network with each other and outreach staff from around the collegiate University. Whether or not you are able to come to the training session, please do come along and share your outreach and public engagement experience and find out more about how you can connect with schools outreach work across the University. Further enquiries about the scheme can be directed to the coordinators at earlycareeroutreach@admin.ox.ac.uk or via eleanor.parker@admin.ox.ac.uk. Soap Box Science: Cosmology on the South Bank! On 30th May, I spoke as part of Soap Box Science in London. 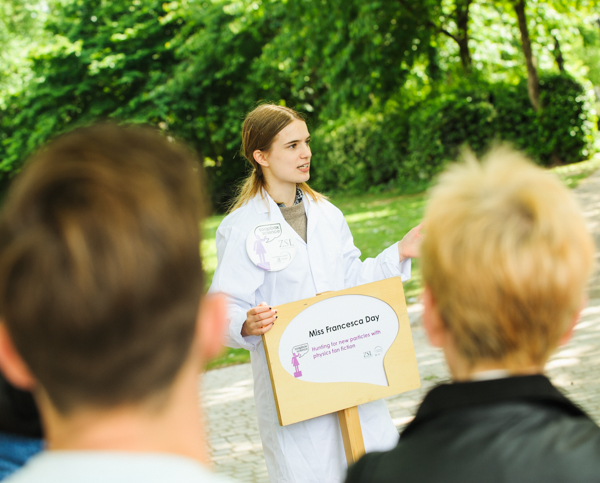 This event showcases female scientists on soap boxes on the South Bank. My slot was an hour long, and the focus was on discussion with the public rather than a one-way lecture. This format was incredibly effective – many people chose to stay for the full hour and the discussion spanned topics ranging from the expansion of the universe to Higgs portal dark matter – issues at the cutting edge of research. I had prepared an hour’s worth of material, but this turned out to be unnecessary – the time flew by with questions and ideas from the audience. One aim of Soap Box Science is to facilitate these kinds of conversations – by putting scientists in public places with no microphones or PowerPoint presentations, where anyone can drop by and say hello. As a theoretical physicist, I am not used to wearing a lab coat (which we wore on the day to draw attention) or doing practical demonstrations. For Soap Box Science, I had great fun with a model of the expanding universe, complete with tinfoil galaxies. As well as helping to visualise a tricky concept in cosmology, this toy proved a great draw, particularly for children. Most of the session, however, was spent discussing some fairly in-depth particle physics without props or demos, dispelling the myth that the public are only interested in science if it has explosions or is directly relevant to their everyday lives. Soap Box Science’s other mission is to increase the visibility of women in science. This extends beyond the event itself. In the lead-up to the event, I took part in several local radio interviews discussing Soap Box Science and women in physics. This is particularly relevant to my own field of theoretical physics. My department is overwhelmingly male dominated. I am perpetually frustrated by the media portrayal of science as “for boys”, and by the (usually) unconscious bias that still exists against female and BAME scientists. We need to seriously engage with issues of gender and racial equality to have an impact, and initiatives like Soap Box Science are part of that process. 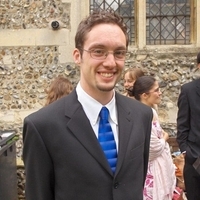 My name is Jonathan Patterson and I am a British Academy Post-doctoral Fellow in French at Oxford. In March 2015 I took part in a careers event for Year 11 and Sixth Formers jointly organized by two local schools in Oxford. I was asked to stand in for a colleague manning the ‘careers with modern languages’ stall. Armed with a stack of brochures from our Faculty office, and with a winsome smile, I set off to try and convince teenagers that studying modern languages at university opens a wide array of interesting careers. It was a thoroughly positive experience. I was paired with a graduate student in Spanish and together we fielded a range of questions. This made us remember what it was like to be a Year 11 student trying to figure out what A-levels to take, and what it would be like at university and beyond. I found that the students were on the whole very thoughtful. Many had already thought quite carefully about their options, but appreciated the opportunity to discuss these further with us in order to get an ‘inside view’. I think that as early career academics we have much to offer in promoting our subject to teenagers. I found the careers fair particularly useful for affirming students who were already thinking of studying modern languages — although, as I’m all too well aware, there is much more work to be done in winning over others. Events like this are a good opportunity to learn how to dispel some of the hang-ups surrounding arts and humanities degrees, and to suggest a range of careers that might follow. Thanks to @Ox_ECAoutreach for inviting me to speak on barriers & motivations for WP learners. You can follow @ucas_analysis for more graphs! “The Early Career Academic Outreach Network Training event for Hilary Term was excellent in both theoretical and practical terms. I was impressed that the session spanned from presentations on new data and ideas informing widening participation to a practical workshop showcasing a new method of combatting the disadvantages that sometimes face non-selective state school pupils. Anne-Marie Canning, Head of Widening Participation at King’s College London, presented a trove of information. She pressed beyond the well-known facts and put new focus on issues that get less press. Chief among them is growing awareness that bursary schemes alone do not overcome disadvantages and that geo-demographics and gender are among the largest hurdles facing universities’ wider participation efforts today. I was especially shocked to learn that up to 42% of state school teachers report that they never or rarely encourage their highest-achieving students to consider applying to Oxbridge. Canning suggested this shows the importance of coupling outreach to students with outreach to other figures who influence their educational decisions, especially teachers and parents. As Director of the upcoming production ‘Sparagmos’, a musical double-bill of Euripides’ ‘Bacchae’ and Poliziano’s ‘Orpheus’, I was keen to reach out to a wider community and use this play as a means of promoting the appreciation and enjoyment of classical tragedy. In my mind, ancient theatre such as that by Euripides is too often regarded as inaccessible or irrelevant, especially by younger audiences. 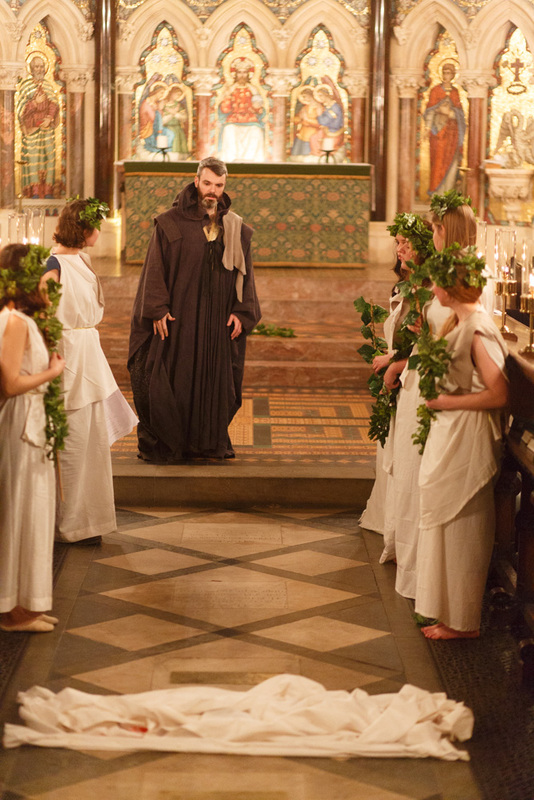 In a bid to take a small step towards changing this, we decided to take the ‘Bacchae’ to the East Oxford Community Classics Centre at Cheney School in Oxford on 11th February, where fifty students from a range of year groups witnessed a special premiere of the production. All involved found it to be an extremely rewarding experience. Lorna Robinson, the Centre’s Director, remarked that the performance was ‘exceptional’, adding that ‘students were able to witness the humour and terror of the play through some stunning performances, including a very arrogant King Pentheus and the fearsome god Dionysus!’ The students proved to be a strikingly attentive and receptive audience; Year 11 Ruchika Ganesh commented: “That was really amazing! The acting was so professional. I loved the singing!”, whilst Year 9 student Barnaby Evans reflected: “that was so much fun! I really enjoyed it”. I was delighted to see that the students were so entertained by the production. Pentheus’ cross-dressing scene was particularly well-received, as was the music sung by the Chorus of Bacchants. I was also pleased to learn that several planned to attend the main performance in Exeter Chapel, for which we have introduced a special student rate of £3 (£1.50 per play). This initiative was certainly worthwhile, and I hope that some- if not all who attended- will have discovered that classical tragedy can hold the same fascination today it did 2500 years ago. Booking now open for Hilary Term training session (Weds 5th week)! What motivates the higher education decisions of widening participation learners? To book a place for the training session, please fill in the form HERE. After the session, participants are warmly invited to The Royal Oak on Woodstock Road from 6.45-8pm to network with each other and outreach staff from around the collegiate University. Whether or not you are able to come to the training session, please do come along and share your outreach and public engagement experience and find out more about how you can connect with schools work across the University.